Spinning reel was originally designed for Carp Fishing. But now, it has been widely used in Sea Fishing, Pike Fishing and Coarse Fishing, almost anywhere a big ones is expected. They gets great gift for hooking big harvest like carp, pike, catfish, striper bass, bluefish and Salmon in ocean. It make hook setting much easier and widen the range if fish sizes and species you could catch even with a smaller reel. Ball Bearings: 11+1BB;6000 | Weight 15.3oz/430g | Max Drag 26.4LB/12KG | Gear Ratio 4.7:1| Line Capacity 0.40mm/240m 0.44/200 0.48/170 | Monofilament Capacity (lbs/yds) 22LB/260Yds,25/220,30/170INNOVATION – Supertrip is a creative team,pay more attention on our real life and then provide better baitrunner spinning reel for customers. 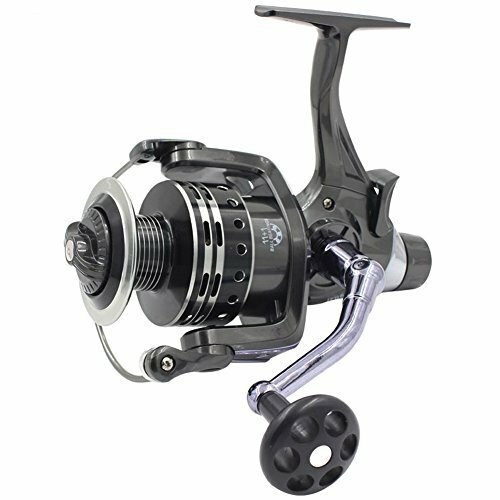 IFR6000 is a unique spinning carp fishing reel with classic front and rear drag, carbon fiber drag by high technology. PRECISION – Each live liner reel is full metal with 10 + 1 corrosion resistant smooth ball bearings, precision matched gears, hard texture, adequate weight. This carp reels is Great predator killer: like carp, pike, catfish, stripper bass, bluefish and salmon in the ocean. POWERFUL-Max Drag up to 26.4LB. IFR6000 spinning reels have carbon fiber drag washers for the smoothest fishing reel drag. A stainless steel as main shaft, CNC machined aluminum spool, high strength high modulus corrosion free graphite body, computer balanced rotor. FLEXIBLE – The reel with its direct drive machined aluminum interchangeable right or left handle matched to a Supertrip carbon fiber fishing rod or your pole, a IFR6000 reel makes the perfect open face rod and spinning reel fishing tackle combo.